We get it, no one has time to spend hours outside picking up trash in the name of saving the planet. But even if you can’t control the way the rest of the world treats the environment (looking at you, litter bugs), you can manage your own impact by turning your home into a mini sustainable sanctuary. And before you get overwhelmed at the prospect of a total home revamp, Property Brothers-style—don’t. Upping your place’s sustainability status is simple if you make a few strategic changes. The creator of The Move + Meditate Method started her home upgrade by swapping plastic food containers and water bottles for glass, and switching her beauty essentials to cleaner alts. She re-painted her bedroom with non-toxic paint in 2015, and is rolling her home green-up into this year. “I didn’t make all the changes all at once—that would have been overwhelming and expensive,” she says. To help you create your own personal environmentally friendly ecosystem, Hurley is sharing her real-life advice for designing a wellness-boosting abode—from which items are really worth the investment to the best way to soak up all those new feel-good vibes. Scroll down for 3 home sustainability tips to boost the good-for-the-planet vibes in your space. You can make major headway on your interior detox by starting with the areas that get the most use. Considering you (hopefully) spend at least eight hours a night cozying up to your mattress, odds are that’s the piece of furniture that wins the quality time test. This winter, Hurley—who shares a home with her husband, Peter, and cat, Javier—decided to refurbish her bedroom starting with her sleep space. She upgraded her decade-old bed to an Avocado Green Vegan Mattress with Pillow-Top—a sustainably crafted, non-toxic mattress made with 100-percent natural latex rubber and GOTS Organic certified cotton. 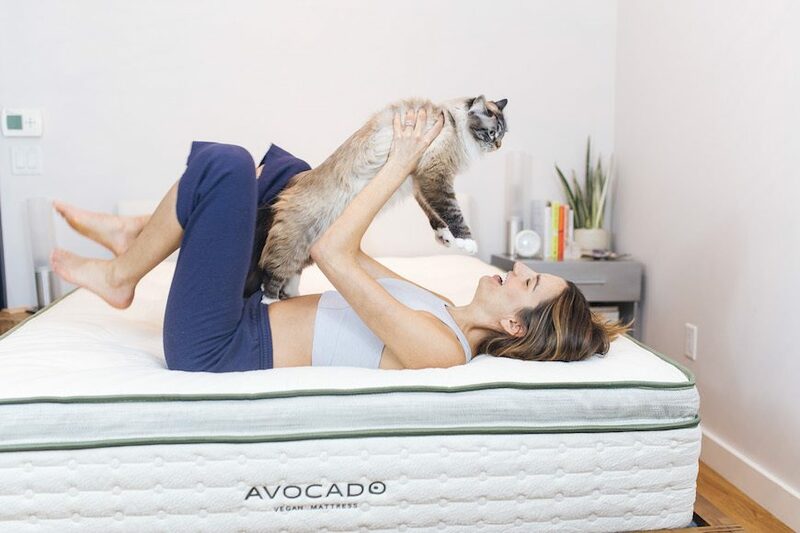 “I chose an Avocado Green Mattress because it’s insanely comfortable, it’s good for the environment, and I know there aren’t any harmful chemicals that will hurt me or anyone else I love,” Hurley says. To complete her non-toxic bedroom makeover, she added an organic cotton mattress pad protector and Avocado Green Pillows as a finishing touch. “The best part of my bed makeover is now my bedroom feels like a place where I can really rest and unwind,” Hurley says. “It’s my little staycation.” Time for a nap. If you’ve hopped on the capsule wardrobe train in an effort to minimize landfill-clogging, fast fashion purchases (or just because Marie Kondo says so)—the same idea can apply to your home decor. Hurley limits the amount of new decor she brings into her home, but when she does buy something new, she tries to shop secondhand. She also suggests switching to LED lightbulbs (which use less energy than traditional bulbs) when your current ones burn out, or adopting a low-maintenance snake plant (which is basically an air purifier you don’t have to plug in). “My home design aesthetic is modern minimalist,” she says. “I’d rather have the space feel a little bit empty rather than fill it up with stuff I’m not completely in love with.” MK would be so proud. A spritz of air freshener or a mood-setting candle might seem harmless in the grand scheme of your greenified home, but when you’re using them every day, all that exposure can add up. Limiting intake of those potentially damaging synthetics was Hurley’s motivation behind ditching her scented candles and sprays—not only for her own benefit, but for her furry friend, too. Even if you don’t have a four-legged pal following you around your home, opting for natural cleaners (try mixing your own essential oil-based blends) to spruce up your newly sustainable space is the finishing touch to enjoying your non-toxic oasis. Next step: Breathe easy.